Mayflower Christian Bookshop is dedicated to providing Bibles and trustworthy Reformed Christian books and literature for the purposes of spreading the gospel of Jesus Christ and building up believers. The bookshop is linked to Spring Road Evangelical Church in Southampton. The shop first opened in Jameson Road, Southampton, in 1976. The premises had been a grocery shop. Spring Road Evangelical Church saw an opportunity to open a bookshop to serve Christians locally and further afield as well as being a witness in the local neighbourhood. The shop’s owner, Larry Darmanin, was a member of the church and became its first manager. We began selling Bibles and reformed Christian books. Through a providential course of events, the bookshop moved to a larger home, about one mile away in Merry Oak, Southampton. The premises was being used as a haberdashery shop and, one day, we enquired if the owners might consider selling the premises? They replied that they were about to advertise the shop at that very moment. This new premises was in a much better location, next to other shops in busy Spring Road (and in the same road as the local evangelical church itself). The new premises was bigger too. God supplied all the funds that were needed. The money to buy the premises was put up by Christians, with assistance from Margaret Armstrong, a retired Christian outreach worker from Kenya, who was able to purchase the flat above. The bookshop gained charitable status and trustees were appointed. The new bookshop was opened in May 1981 by the Mayor of Southampton, John Deacon, who was also Chairman of Portsmouth Football Club at the time. Also in attendance as a guest was local Southampton Itchen MP, Bob Mitchell. As well as selling reformed Christian books, Mayflower Christian Bookshop also began publishing its own. These included titles written by David G Fountain, who was minister of Spring Road Evangelical Church at the time and was also a bookshop trustee. He authored books (still available from the bookshop today) that included Isaac Watts Remembered, John Wycliffe – The Dawn Of The Reformation and Lord Radstock Of Mayfield as well as booklets that include Let Conscience Speak. His most well known title was Isaac Watts Remembered, the official biography of this famous hymn-writer, commissioned by the City of Southampton (Watts’ home city) to mark the 300th anniversary of his birth. The book was first published in 1974 and several reprints (by Mayflower Books) followed. 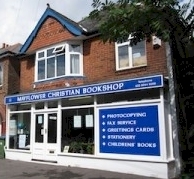 Mayflower Christian Bookshop was also instrumental in publishing important titles by other authors. Notable highlights include Spiritual Food by the imprisoned Chinese pastor Wong Ming-Dao; and After The Puritans, the story of hardship and suffering experienced by Axminster Independent Church. Another innovation for the shop was the publication of teaching resources for children. Spring Road Evangelical Church had been producing its own Sunday School materials for some years. Now other churches expressed in an interest in getting these – so the bookshop began publishing Mayflower Bible Lessons. Each year, thousands of lessons are produced and distributed to Sunday Schools across the UK. Following this came Mayflower Christian Resources, which has seen teaching materials created especially for RE lessons at primary schools. They can also be used to help with assemblies. The manuals come in the form of two free-to-photocopy manuals. More than 2,300 copies of the manuals have been sold to schools of all types. Next has come Bible Treasure, a set of easy-to-read daily readings for Bible beginners. Children (aged 8+), teenagers, overseas students or adults who have little or no knowledge of the Bible will benefit. Bible Treasure encourages them to read the Bible every day and to understand its wonderful message. Today, the bookshop is staffed by a large team of volunteers, managed by Teresa Mitchell, under the oversight of the Trustees of the Bookshop, who are all members of Spring Road Evangelical Church. Some volunteers help in the shop itself, while plenty work behind the scenes and in our warehouse, packaging books for postage and hand-preparing our Mayflower Bible Lessons and other resources. In 2016, the bookshop marked its 40th anniversary, God willing. We can faithfully say that throughout the years, God has provided all the funds, resources and people needed to keep the work pressing ahead, for His Glory. We hope you find the bookshop useful, whether you shop online or visit us.